Benjamin Franklin trips to England - How many times did Benjamin Franklin travel to London during his life? Three times! Each time he was there for many months or years at a time. He actually spent a good deal of his life overseas in the service of his country. Much of it in England. The details of these trips are listed below. The first time Benjamin Franklin went to England was in 1724 at the age of 18. He was going to by printing equipment to open up his own print shop and possibly start a newspaper. Sir William Keith, the Royal Governor of Pennsylvania, had promised to pay for equipment if Ben would go to London to pick it out and bring it back. Governor Keith promised to send a letter of credit (which is a promise to pay for something) ahead of Ben so he would have the money when he got there. Unfortunately, when Ben arrived in London on December 24, 1724, he realized that Governor Keith had not followed through on his part and had no intention of paying for the printing equipment. This left Ben stranded in England at the age of 18. Ben went straight to the printing house of Samuel Palmer, who was a famous and prestigious British printer, and got a job within a few days. Ben stayed in London for about a year and a half, working to live and earn the money to pay for the trip back to Philadelphia. During that time he also worked for another famous London printer, James Watts. Ben finally left London on July 22, 1726 with a merchant from Philadelphia, Mr. Thomas Denham, a shopkeeper for whom Ben worked when they returned. They arrived back in Philadelphia on October 11, 1726. The second time Ben Franklin went to London was in 1757. Over the years, he became more and more involved in politics, serving as a councilman, Pennsylvania Assemblyman, Deputy Postmaster General and other positions. Pennsylvania was technically "owned" by the Penn family. The Royal Charter for the land had originally been given to them by King Charles II in 1681. This made the Penn family essentially the final rulers of the colony. Even though the colony had a legislature made up of local citizens that could pass its own laws, the Penn family could override the legislature if they chose to do so. Conflicts developed over the years between the Penn family and the colonists because of this and by 1757, the colony hired Ben Franklin to go to England to represent their concerns about the Penn family's arbitrary authority to King George II. His mission was to get the King to end the Penn family's right to overturn the colonial legislature and get him to overturn the Penn family's exemption from paying taxes. They had HUGE land holdings and were completely exempt from paying ANY taxes. Franklin was in England this time for five years and was ultimately unsuccessful in persuading George to limit the Penn's authority. He finally left London in August and arrived back in Philadelphia on November 1, 1762. By 1764, the colonists were in an uproar over the Sugar Act, the proposed Stamp Act and other activities of the British Parliament and King George III. The Pennsylvania Assembly once again appointed Franklin to represent its interests before the King. He sailed for London on November 7, 1764 and arrived there on December 10. This time he stayed in London for eleven years representing the colonists of Pennsylvania before the King! He later also becomes representative to the King from the colonies of Massachusetts, New Jersey and Georgia. Over this time period, King George and Parliament continued to deny the American colonists basic rights regarding taxation, lawmaking and various other issues. Franklin, being in London, saw first hand the belligerence of the British lawmakers and eventually realized that diplomacy was not going to solve the differences between the two sides. He finally left London on March 20, 1775 and arrived in Philadelphia on May 5. The very next day he was elected by the Pennsylvania Assembly as a delegate to the Second Continental Congress. If you would like to learn more about Benjamin Franklin, go to our Facts about Benjamin Franklin page here. Learn about Ben Franklin's discoveries with electricity at our Benjamin Franklin and Electricity page. 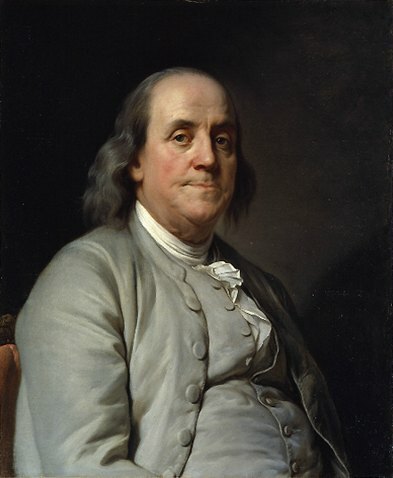 You can read about Ben's various inventions at the Benjamin Franklin Inventions page here and you can read Ben Franklin Quotes here.